Choosing a memorable yearbook quote or catchphrase is a great way to make a lasting impression. Let your legacy live on in the pages of your yearbook and use a quote that reflects your personality and wit. There are endless quotes and catchphrases to consider from serious to silly. Today's special moments are the memories of tomorrow. This moment will be just another story one day. For the senior's pages many schools use a quote under the photo of the student-something short and simple. The student typically chooses a quote that defines them or is a reflection of their personality. "I hope you had the time of your life." - Green Day, "Time of Your Life"
"We've come too far to give up who we are, so let's raise the bar and our cups to the stars." - Daft Punk, "Get Lucky"
"Feeling so good. Looking so bad." - Rihanna, "Rock Star 101"
I'm not actually funny. I'm just really mean and people think I am joking. I wanted to be a nice person but everyone was always so stupid. Cheaters may never win but I just graduated! Thank you, teachers, for never giving up on me. See you all at the 10-year reunion! We did our time and now we are free! Live every day like it is your last. Don't look back since you are not going that way. Watch out! I may be your future president! High school looked so much cooler on TV. So much to do, no desire to do it! Before you were born we dreamed about the young woman/man you would become. You have turned out even better than our best dreams. Always remember, never forget, and look towards the future! Reach for the stars, they are yours! Anything is possible if you believe in yourself! Keep your dreams big and worries small. Follow your heart and you will never go wrong. Cheers to the mistakes we've made, cheers to the laughs we've shared! Our senior year has been a blast, only thing is it's gone by way too fast. Remember me when you are rich and famous! Be yourself and the world will be a better place. I hope this isn't our last goodbye. Write on the spine of the page with "I signed your crack!" A yearbook is a great way to commemorate the fun or drama of high school and is something you can look back on for years to come. So using a witty or meaningful yearbook quote or saying will make a lasting impression. 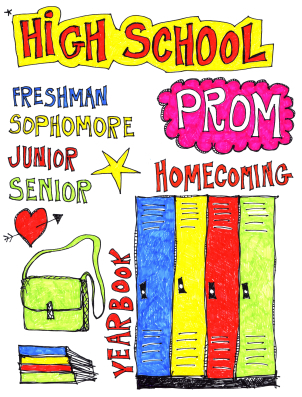 You can add some flair to your yearbook by incorporating one of these catchphrases or quotes that sums up your feelings or personality, or you can use them as inspiration to come up with a unique phrase tailored to you. "Yearbook Quotes and Catch Phrases." YourDictionary, n.d. Web. 20 April 2019. <https://quotes.yourdictionary.com/articles/yearbook-catch-phrases.html>.